Alexei Kuzmich Denisov-Uralsky (1863-1926) is famous more for his paintings and hard stone animals than for his jewellery. 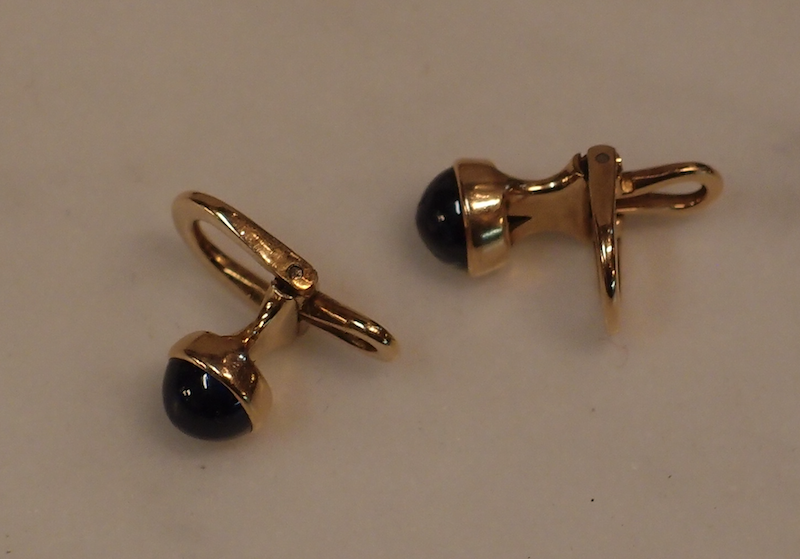 Yet here are a pair of articulated dress or collar studs. The hard stone animals are usually associated with Faberge, but many, particularly those with gold around the gemstone eyes, are by Denisov-Uralsky. This pair of 14 ct gold and sapphire collar studs are in their original box, stamped A. Denisoff-Ouralsky, Moika 42, St Petersburg. The studs are hinged at the back to allow ease of insertion. The studs are stamped with a Kokoshnik hallmark with the St Petersburg alpha and the 56 for 14 ct gold. The workmaster's stamped initials are, not surprisingly, A.D. The box is 5.2 cm wide. Alexei Kuzmich Denisov-Uralsky (1863-1926) is famous more for his paintings and hard stone animals than for his jewellery. Yet here are a pair of articulated dress or collar studs. The hard stone animals are usually associated with Faberge, but many, particularly those with gold around the gemstone eyes, are by Denisov-Uralsky. 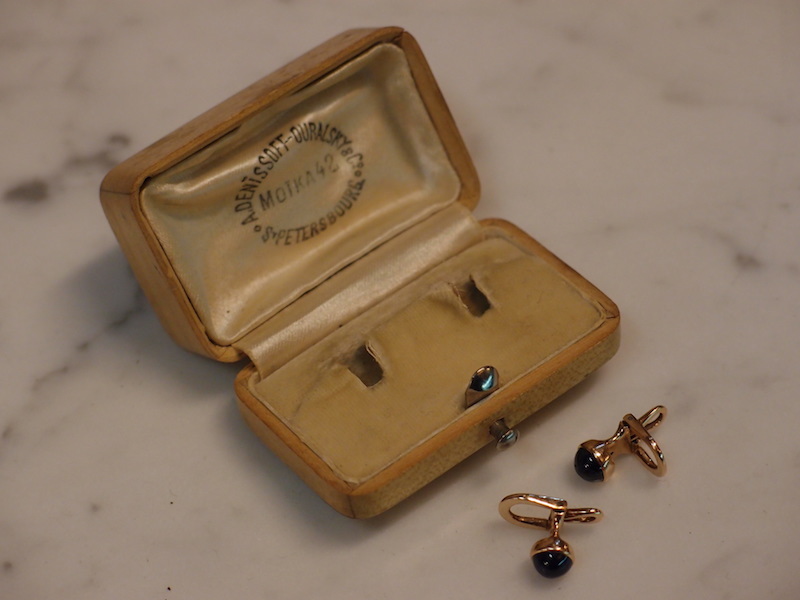 This pair of 14 ct gold and sapphire collar studs are in their original box, stamped A. Denisoff-Ouralsky, Moika 42, St Petersburg. The studs are hinged at the back to allow ease of insertion. The studs are stamped with a Kokoshnik hallmark with the St Petersburg alpha and the 56 for 14 ct gold. The workmaster’s stamped initials are, not surprisingly, A.D.